Does It Catch Mice? : A "Bridge" Connecting What? 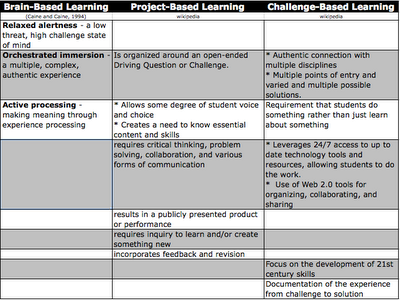 1) How well-suited are the classroom learning activities aligning with these characteristics? 2) Specifically, how is technology being used to develop activities that align with these characteristics? As a visual learner, I've taken the liberty of summarizing the characteristics into a chart. 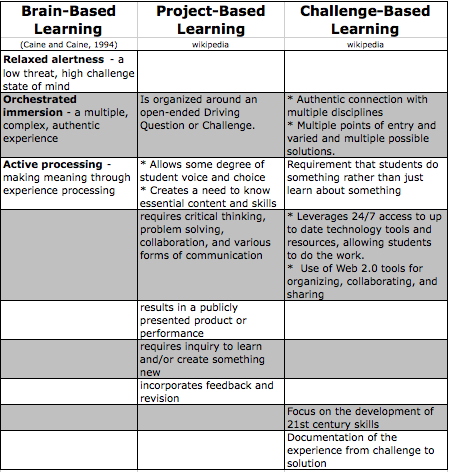 Obviously, there are many overlapping criteria in the three models of learning and I did my best to align similar aspects in the same row, although it is fair to say that these alignments are certainly debatable. Many of you most likely remember the simulation Oregon Trail - the purpose-filled quest with educational outcomes and content buried within. How closely have we adapted classroom resources like that – utilizing all that Web. 2.0 can do – to create innovative, collaborative, and dynamic environments where students are constructing their own learning for an authentic purpose? How are we using technology in the classroom to enhance learning? We all recognize that technology allows us to access INFORMATION – of course, we can thank Google, wikipedia, and those webcams shooting us the live feed of the watering hole in the African safari, but lets not forget other applications (online or not): digital field trips, explorations of the solar system or the human body, or online textbooks. Technology allows information to be presented in a much more creative manner; it can be interactive; it some cases it can even be responsive and prompt us to construct meaning. These are needed and helpful applications of technology. But at the end of the day, these examples of technology are presenters of information. (There is no doubt that if we are utilizing technology correctly in this information-access capacity we need to be re-structuring the “what” of our curriculum to deal with the information overload and instead help students to effectively find, sort, and sift information into a pattern that has meaning - namely, making our students "information literate". The other use of technology in schools tends to be more glorified applications of Web 2.0 and how these technologies are meant to transform school. It is in this category, that we often hear the refrain that the specific technology application is irrelevant, and that the skills of this new “information literate” curriculum are meant to take focus - and somehow 2.0 technologies will easily be incorporated into the classroom to help in this process. But current Web 2.0 technologies (Twitter, Facebook, and even Wikis and Noodle to a lesser degree) can pose a struggle to a teacher who is aiming to achieve specific learning objectives demanded from state standards. These Web 2.0 applications achieve high-marks in creating the collaborative environment that we all envision in a Problem/Challenge Based Learning classroom, and they certainly make use of technology to make that environment a reality. But they will continue to be under-utilized until teachers are presented with a more clearly defined way in which these technologies can get students to the standards in a way that is effective and efficient. We should be striving to also develop technology applications that DO have content embedded (think Oregon Trail) and still allow for learning environments that are consistent with the chart above. While it is impossible to disagree with wise folks like Dave Warlick who espouse that it isn’t about the technology – that schools today should strive to produce information-literate users who can sift and sort through the mountains of information, recognize bias, and utilize Blooms upper levels fluently – I believe the technology really does matter ! If we attempt to implement 2.0 applications and hope/expect that these the more traditional content standards are integrated more efficiently, we are going to force teachers into an either-or mentality where their devotion to information literacy will almost surely come at the expense of content (and standardized tests) which are so highly valued. In this light, we may be causing a confusion (and reluctance) for some teachers who can't justify the use of these 2.0 technologies and therefore don't embrace them. 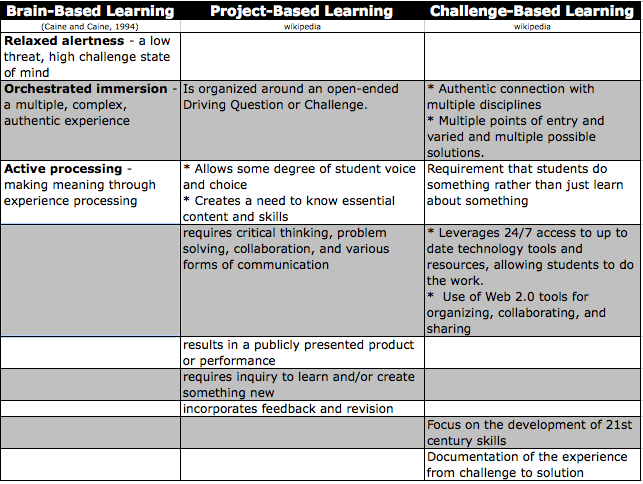 There is a third way that technology is being applied which synthesizes the two, known as Project Based Learning. Usually, these include a healthy does of technology (and usually, Web. 2.0 technologies !) tied into a specific topic such as analyzing water treatment facilities, or saving polar bears. The projects are great examples of specific topics in which students are involved with an authentic purpose and utilizing technology to compile and share data with other student-users who then collaborate on questions, proposals and solutions. In many ways, these projects blend the best of both worlds – the content, skills, and understandings that are needed to analyze water quality combined with Web 2.0 applications to promote collaboration and feedback. In the truest sense, these authentic activities allow students to “think like scientists / public health officials/ historians /etc." It is no wonder that these are the types of activities that often spur the break-out enthusiasm in students that give the topic life when the unit is over. If there is a drawback to these, it is that the slices of content may not be applicable to all . (Do other/many schools study water quality in the 9th grade?) Furthermore, these types of projects usually require at least one teacher to be well-versed on the sources referenced, collaboration tools used, and overall structure of the project requirements to become involved. This is especially true for those pioneer teachers who initially start the project and put in significant hours of development. But we certainly can see the development of technologies that offer both the content and the freedom to teachers and students (again, think Oregon Trail) so that multiple directions can be taken, students can explore, and teachers can customize according to students' abilities and course learning outcomes. The most logical source for these types of applications will be educators. In a future posting, we’ll explore some examples that are out there, ask for your help in identifying others, and share a few structural resources that are currently available as well as a few that we need to add in order to encourage more innovative technologies. Derek, Your blog reminded me of a recent blog I read by Betty Ray titled "Increase Student Engagement by Getting Rid of Textbooks", http://www.edutopia.org/blog/student-engagement-shelly-blake-plock-teachpaperless-edchat. While you're coming at this topic from pedagogy, Betty addresses it from a resource perspective. Wouldn't it be fabulous if we pushed money used for textbooks to the school, or even classroom level, giving teachers access to use the resources best suited to their students? Thanks Mickelle. I checked out Betty Ray's blog on Edutopia - right you are. It's pretty hard for teachers to get any resources pushed through because we see so many district led pushes where teachers are simply told what to teach and with what resource. I try to find analogies to this model in other industries / organizations, but I always get stuck. Any out there that can help?